[caption id="" align="alignright" width="400" caption="Wonderful views from the Blue Ridge ParkwayThe Blue Ride Parkway runs almost the entire length of Virginia. 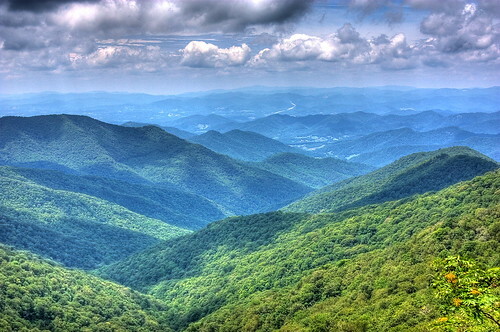 It joins the Skyline Drive just east of Waynesboro, VA, in the Shenandoah Mountains, and it slowly meanders its way for nearly 475 miles to Cherokee, Tennessee, in the Great Smoky Mountains National Park."] [/caption] Virginia's Blue Ridge Parkway is the type of road that requires a leisurely pace. Time slows down on the Blue Ridge Parkway if you let it. The views will take your breath away, whether they span valleys and mountains or reveal a small, almost hidden waterfall. As you travel, plan on staying at a number of Virginia bed and breakfasts near the Blue Ridge Parkway - that way, you'll have plenty of time to fully enjoy each leg of your journey. Virginia bed and breakfasts near the Blue Ridge Parkway have much to offer. Aside from being a place to sit and enjoy great views, they are great bases for exploring the area. The innkeepers can be your local insiders - people who know the area well and who can provide priceless travel tips. Take advantage of your stay by heading out to listen to mountain music; opportunities for this include the Floyd Country Store Friday Night Jamboree, Pickin' Porch, and several festivals throughout the year. Spend a day or two visiting Blue Ridge Parkway area wineries, sampling wines produced in the fertile valleys. Vow to stop at every antique shop you see. Travel the Blue Ridge Parkway when flowers are in bloom. the parkway website handily provides a Bloom Schedule, so you'll know when your favorite trees, flowers and shrubs are at their most beautiful. These times can be ideal for hiking the trails along the Blue Ridge Parkway. Ask bed and breakfast Virginia innkeepers about favorite hikes near their inns. You are sure to enjoy your time traveling the Blue Ridge Parkway, especially if you treat yourself to lodging in Virginia bed and breakfasts.